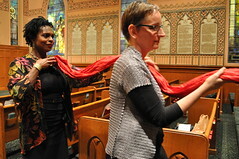 Meredith Hoffman Top: Jacqui Lewis, left, and Tricia Sheffield grasp a red cloth dedicated to victims of AIDS during a Wednesday night ceremony at Middle Collegiate Church commemorating World AIDS Day. Debbie Totten knows about loss. Four years ago, her brother Frank committed suicide after learning that he had contracted AIDS. 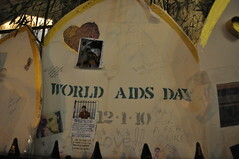 “He had the beginnings of AIDS but he took his own life,” said Ms. Totten, a 53-year-old native of the East Village. Two years later, her brother’s friend also committed suicide when he learned that he, too, had AIDS. On Wednesday night, Ms. Totten and 25 fellow congregants silently held candles in Middle Collegiate Church during a worship service to commemorate World AIDS Day. And though the service’s message was of hope, the story of Ms. Totten and many others was of loss, with entire past communities gone, because of AIDS. “There’s nobody here anymore I grew up with. Most of them passed away from the virus,” said Ms. Totten. While most of her friends contracted HIV back in the 70’s, she said that she’s known even more infected people in the neighborhood in recent years. Every Monday with Middle Church Ms. Totten volunteers, giving hot dinners and groceries to people with AIDS. She volunteers at another food pantry on Wednesdays, but came to last night’s service instead, to reflect.